At the NCAA Regional Championships I finished 16th and got my first All-Region-Honor. For most cross country teams, the NCAA Regional Championships is the most important race of the season. It is the main opportunity to qualify for the National Championships. In NCAA Division I the country is split into nine regions with 20 to 30 teams in each. The qualification system is a bit complicated to describe. In each region the top two teams and the top four individual athletes from the non-qualifier-team get a spot for nationals. In addition there are 16 teams qualified, who defeated the highest ranked teams during the season. 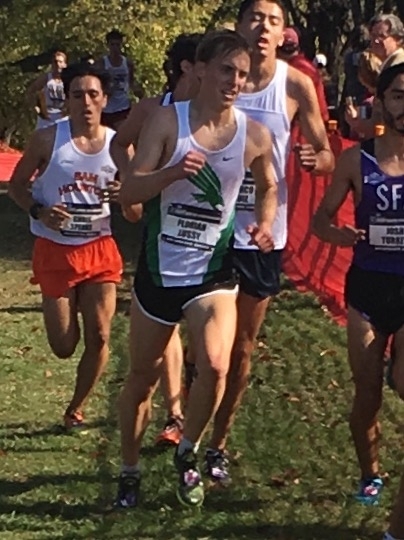 In the South Central Region, in which UNT competes this usually means that I have to finish in the Top 10 to have a chance for the individual qualifier spot. Compared to the last races we decided to run a different race tactic. Our goal was to start the first three kilometers a bit slower and more controlled because this course has plenty of space to overtake athletes. Another reason for this decision is that I wanted to feel better after three kilometers than I did the last two races. It can also give a motivation boost when you overtake other athletes. Because of that I focused on running the first uphill kilometer as relaxed as possible and after two kilometers I was in 62nd position. Since in the USA the races start really fast, I already to caught the first (too) fast starting athletes after the first mile. As planed I felt much better after five kilometers, this gave me confidence to attack the second half of the race. In the end I ranked in 16th position with a time of 31:02. I finished 1:04 behind the winner and 30 seconds after the fourth individual qualifier. Even though I missed the qualification for the National Championships I am satisfied with the race. After a 131st finish at Pre-Nationals and a 18th place at the Conference Championship, this result is a big improvement. This shows my performance getting better from week to week. Now, I have another month of training upcoming to improve my form. On December 11, the European Cross Country Championships will take place in Chia (Italy), where I would like to represent Switzerland.